Welcome to the AS Roma Shirts shop at Soccer Box. Here you can order your home, away or third shirt, shorts and socks for the current soccer season. We are supplied directly by Nike ensuring that you will be ordering the official jersey and team kit. With junior and adult sizes available, you can stock up on the latest Roma Nike kit, but hurry supply is limited so place your order now. 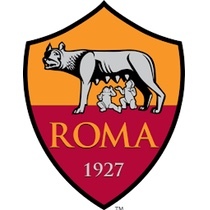 Associazione Sportiva Roma was founded in 1927, and have since been a mainstay of top-tier Italian football. In fact, the only season that the club has not featured in the top-flight was 1951/52. This fact makes Roma once of the most consistent teams in world soccer, and illustrates why the jersey is popular in Italy and around the world. Roma is the fifth most supported club in Italy, and demand for the official Roma shirts spans far and wide beyond the confines of the City of Rome. The club’s biggest rivalry is traditionally with Lazio, with Napoli close behind. In 2013 the football club signed a 10-year manufacturing deal with American company Nike. Since the 2014/15 season the iconic Nike Swoosh has adorned the clubs match day and training gear. Nike has since created a beautiful array of home, away and training wear that perfectly encapsulates the ethos and history of the club in a modern and striking fashion. If you’re looking for the latest Roma home jersey, look no further, we stock the full selection of football shirt, shorts and socks for kids and adults in our online store. Over the years the uniform has been produced by an array of sportswear manufacturers. Adidas, Kappa and Diadora have each had several stints producing the Roma jersey, below we list the highlights in the history of the football strip manufacturing. Recent seasons have been some of the best in the history of AS Roma. The squad have won three Serie A titles in their history, the most recent in 2001. However, since then each season has been played with a palpable sense of the title being within their grasp. Between 2001 and 2017 Roma has tallied an impressive, nine 2nd place finishes, surely the time is ripe for another Serie A victory? With so many near misses, and a storied history of success being a fan of AS Roma provides plenty of action and drama. The perfect way to highlight your team allegiance is to wear the football shirt with pride. Whether it is simply a jersey or the full kit, with shorts and socks you can shop for it all here at Soccer Box. From small-boys to XXL we supply the official Roma fotball shirts. With low prices, secure online shopping and fast worldwide delivery, ordering with us is hassle free and easy. Simply order using the quick checkout and await delivery of your Roma football shirts. Take a look at our fantastic Trustpilot feedback, and remember to leave your own feedback after taking delivery of your items.